How many know that Thomas Jefferson compiled a book based on the four gospels? It is widely assumed by cynics today that most if not all of the founding fathers did not really believe in God. This challenging article unearths many authentic, but little-known quotations relating to their religious beliefs. The Bicentennial year has been marked by the reemergence of religion as a major issue in American politics. The "religious issue" is once again a viable part of election-year strategy. The 1960 election of a Roman Catholic to the U.S. Presidency had apparently taken religion out of national politics. At least many observers thought so. However, events of the last few months have shown that the religious issue was not completely dead, but only slumbering. It has been widely reported that the front-running Democratic candidate for President. Jimmy Carter, is a man of very deep religious convictions. He is a deacon and a Sunday-school teacher in one of the largest and most respected Protestant denominations. He has not totally omitted his "commitment to Christ" from his campaign speeches. Major American news magazines have printed articles reporting on Mr. Carter's relationship with God. Once again a man's religious beliefs may be one of the more important factors in the presidential choice of the American electorate. The Oval Office — Responsible to God? The vital importance of religious ethics reappeared on the American scene in the wake of Watergate. The religious conversion of one of the convicted felons was widely circulated in newspaper and national magazine articles. Atheists, agnostics and skeptics a like were shocked by the overtly religious Presidential pardon speech. In pardoning former President Nixon. Mr. Ford said: "The Constitution is the supreme law of our land and it governs our actions as citizens. Only the laws of God, which govern our consciences, are superior to it. As we are a nation under God, so I am sworn to uphold our laws with the help or God [emphasis mine throughout article]." However, one writer for The Humanist (Nov. — Dec. 1975) took issue with our head of state. "Ford taking cues from God rather than the American people is not only an outrageous assault on a system of justice where we claim equity before the law, it is also an insult to our intelligence and our belief in alternative belief systems." Notwithstanding the furrowed brows of worried nonbelievers, the theological beliefs of all our presidents have been colored by their religious backgrounds. Our founding fathers were no exception. The written testimony of the historical record cannot be summarily cast aside as "religious double-talk." On July 4, 1776. it was the unanimous declaration of thirteen united States that When in the course of human events, it becomes necessary for one people to dissolve the political bonds which have connected them with another, and to assume among the powers of the earth, the separate and equal station to which the Laws of Nature and of Nature's God entitle them..." All fifty-six members of that congress apparently believed that God entitled them to their separate but equal status with Great Britain. Continues the Declaration of Independence: "We hold these truths to be self-evident, that all men are created equal, that they are endowed by their Creator with certain inalienable rights.... "The founding fathers at least formally believed all men were created by God. Several years down the road came the U.S. Constitution. Added to it were the first ten amendments called the "Bill of Rights." Amendment one stipulates: "Congress shall make no law respecting an establishment of religion, or prohibiting the free exercise thereof...."
Decades later Abraham Lincoln decided to draw upon the wisdom of the nation's founding document. In his famous Gettysburg address. President Lincoln stated: "Fourscore and seven years ago our fathers brought forth on this continent, a new nation, conceived in liberty, and dedicated to the proposition that all men are created equal.... that this nation, under God, shall have a new birth of freedom...." It was Lincoln who added the previously "officially unwritten" concept that we are a nation under God. So President Ford, in exercising his religious freedom guaranteed under the first amendment to the Constitution, extrapolated part of his now famous presidential pardon message from some very rich and deeply rooted historical precedents. He did not invent the God consciousness that has been with our nation since its inception. Even Sir Winston Churchill considered the opening sentences of the Declaration of Independence to be both "familiar and immortal." He further considered the American Constitution as "a reaffirmation of faith in the principles painfully evolved over the centuries by the English-speaking peoples." Sir Winston commented that the Constitution "enshrined long-standing English ideas of justice and liberty." These fundamental historic documents revealed something of the religious beliefs of their formulators. "Rights were 'God-given'; man was 'endowed by his Creator'; there were 'natural laws' and 'natural rights', freedom was related to the 'sacredness' or man" (Norman Cousins. In God We Trust, p. 10). It is certainly true that not everyone of our founding fathers professed a formal faith. However, most of them "maintained respect for the Bible as the source or the Judaeo-Christian religious beliefs..." and they "most certainly did not turn against God or lose their respect for religious beliefs" (ibid., pp. 8-9). It is axiomatic that we owe these men a great debt for the vast religious freedoms we now possess in the United States. Each one contributed to our freedoms something a little different from the other. The founding fathers could not guarantee spiritual happiness to any individual — only the pursuit of it. They could not guarantee anyone an adventurous, abundant and full life. What they could do was to create a climate for the further development of the human potential. And this they did! "...The founders had a deep respect for the spiritual urge in man. They believed that religious experience was an intensely personal one, and they were historically mindful of the ease with which religions tended to be arrayed against each other, often at the expense or religion itself. Therefore, if man's natural right to his religious beliefs was to be upheld, he had to be protected not only against the authoritarian antireligious state but against religious monopoly. "For confirmation, the founders had only to consult history. Many denominations, in a clear position of authority, were unable to resist the temptation of moving toward a monopoly. Hence the need to guarantee the religious freedom of all as the best way of serving the spiritual needs of the individual" (op. cit., pp. 9-10). So the founding fathers separated Church from State. In a theocracy directly ruled by the Creator God, church and state would go hand-in-hand. But in a secular world often hostile to God, separation is an absolute necessity. Jesus Christ enunciated this principle in the gospels. "Render therefore unto Caesar the things which are Caesar's: and unto God the things that are God's" (Matt. 22:21). Our national and personal debt to the founding fathers is a heavy one! 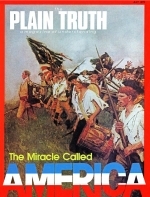 The Plain Truth family (its editors and readers alike) owes a great deal to the founding principles of this free nation. Without freedom of re1igion The Plain Truth would be in jeopardy or publication. Getting God's Announcement to the nations would be difficult indeed. But thanks be to our Creator for his creation of America. "God mend thine every flaw." "To the corruptions of Christianity I am indeed opposed, but not to the genuine precepts of Jesus himself. I am a Christian, but I am a Christian only in the sense in which I believe Jesus wished anyone to be." The third President of the United States was a champion of religious freedom as was his successor, James Madison. Jefferson wrote the bill for religious freedom in Virginia. He was a philosophical "father-figure" of the Bill of Rights. Because of his disregard for denominationalism, Thomas Jefferson was frequently attacked as an unbeliever. He defended himself to the point of writing The Life and Morals of Jesus — his own compilation of the heart, root and core of the teachings of Jesus Christ. However, it must be said of Jefferson that he leaned heavily in the direction of Deism — apparently denying the biblical miracles. On the other side, it must also be said that he had an enormous interest in the Christian religion. "Without his concurring Aid... we shall be divided by our little partial local interests, our Projects will be confounded and we ourselves shall become a Reproach and a Byeword down to future ages." Franklin outlined his personal religious creed to Ezra Stiles in a letter written just before his death: "Here is my creed, I believe in one God, Creator of the Universe. That He governs it by His providence. That He ought to be worshipped. That the most acceptable service we render Him is doing good to His other children.... As to Jesus of Nazareth... I think the system of morals and his religion, as he left them to us, the best the world ever saw or is likely to see; but I apprehend it has received various corrupt changes..." (In God We Trust, pp. 18-19). Builders of Babel: we shall be divided by our little partial local interests, our Projects will be confounded and we ourselves shall become a Reproach and a Byeword down to future ages." "... humbly offering our prayers and supplications to the great Lord and Ruler of nations and beseech him to pardon our national and other transgressions...."
The father of our country was a very private person when it came to his religious beliefs. Specific personal views are, therefore, difficult to document. But "Whatever the precise facts, it is most certainly untrue that Washington was an Atheist, as was charged during his Presidency and at various times since" (In God We Trust, p. 47). Most of his speeches and writings about Deity cast God in a national setting. Take for example the first Thanksgiving Day proclamation under the Constitution in New York City on October 3, 1789. He said: "Whereas it is the duty of Nations to acknowledge the providence of Almighty God, to obey his will, to be grateful for his benefits, and humbly to implore his protection and favor... And also that we may then unite in most humbly offering our prayers and supplications to the great Lord and Ruler of nations and beseech him to pardon our national and other transgressions, to enable us all, whether in public or private stations, to perform our several and relative duties properly and punctually." "...the duty which we owe to our Creator... can be directed only by reason and conviction, not by force or violence..."
Our fourth president excelled in biblical courses as a graduate student at Princeton, especially In Hebrew language studies. He continued his theological studies throughout his life. In the field of religion, James Madison was first and foremost an advocate of freedom of worship. In helping draft the state constitution of Virginia, Madison wrote the first rough manuscript of the article on religious freedom. It proved to be a philosophical fore runner to the first amendment to the Bill of Rights. We quote It here: "That religion, or the duty which we owe to our Creator, and the manner of discharging it, can be directed only by reason and conviction, not by force or violence: and therefore, that all men should enjoy the fullest toleration in the exercise of religion, according to the dictates of conscience, unpunished and unrestrained by the magistrate, unless under colour of religion, any man disturb the peace, the happiness, or safety of Society. And that it is the mutual duty of all to practice Christian forebearance, love, and charity, towards each other" (The Journal of the Virginia Convention, 1776). "As I understand the Christian religion, it was, and is, a revelation. But how has it happened that millions of fables, tales, legends, have been blended with both Jewish and Christian revelation that have made them the most bloody religion that ever existed?" The second President of the United States was perhaps more of a Puritan and a fundamentalist than the others, though it is difficult to hang a hard and fast label on him. He was "...called a Puritan, Deist, Orthodox Christian [fundamentalist], and Humanist in one lifetime..." (In God We Trust, p. 75). Famous American historian Page Smith wrote: "John Adams was as determined to hold to the reality of a personal God and life beyond death as he was to eschew Calvinism's insistence on predestination, infant damnation, election, and other tenets held in strictest observance by his Braintree [Massachusetts] forebears" (John Adams, vol. 1, p. 29). President Adams knew that churchianity could not resist blending "paganism with the Bible. "He wrote: "As I understand the Christian religion, it was, and is, a revelation. But how has it happened that millions of fables, tales, legends have been blended with both Jewish and Christian revelation that have made them the most bloody religion that ever existed?" (In God We Trust, p. 75).